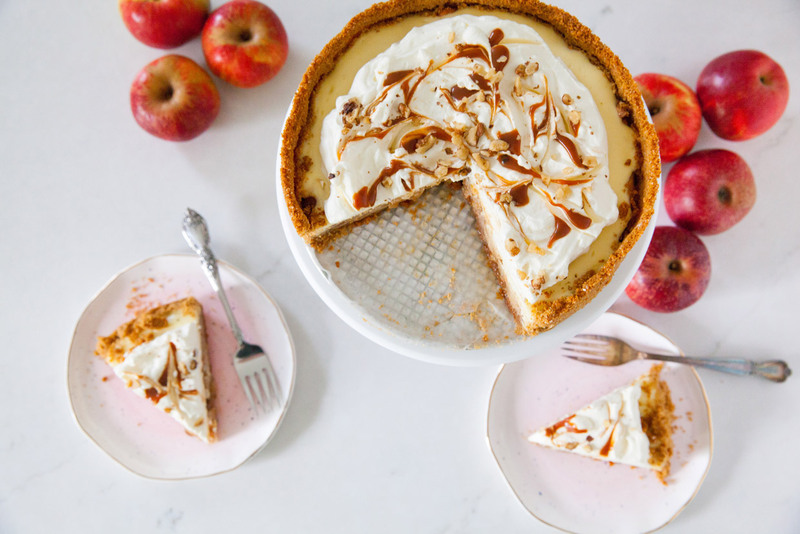 This over the top caramel apple cheesecake pie is one of the the first recipes I shared on my blog that went truly viral. 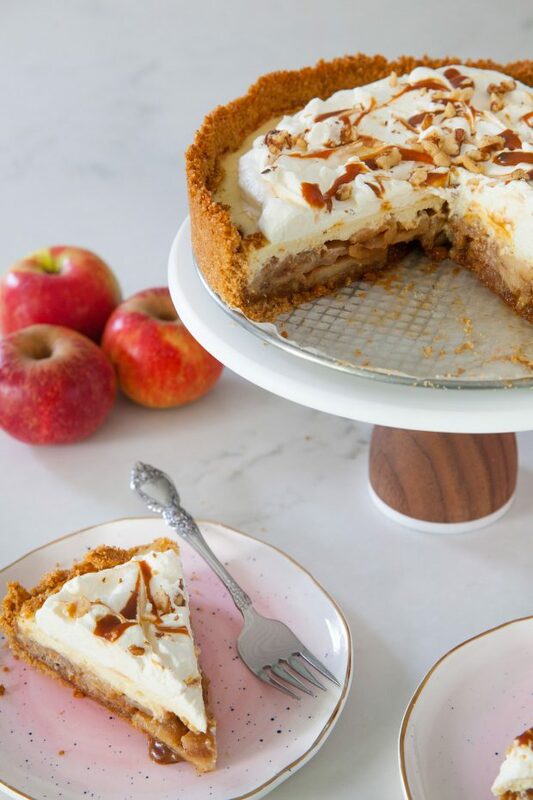 It was all the rage, and for good reason – it starts out with a graham cracker crust, then a layer of caramel and nuts, a thick pile of caramelized apples, topped with a layer of cheesecake, and is finished off with whipped cream swirled with more caramel and nuts. Given the popularity of this classic and the fact that I still adore it, I figured it was time to revisit the recipe both for some freshened up photos and some mild recipe tweaks (mainly reducing the sugar in an already very sweet recipe.) To be honest, sometimes I like to revisit older popular recipes and see if they were really as good as I remember. Thankfully, this passed the test of time and I still think it is wonderful. This is an especially wonderful choice for a Thanksgiving dessert spread because with both apple pie filling and cheesecake, it checks off two dessert boxes at once. This means you get two rocking desserts in one and perhaps you have more room on the table for other fantastic desserts. It’s a win-win-win, I promise you that. To make the crust, preheat the oven to 375° F. Line the bottom of a 9-inch round springform pan with parchment paper. In a medium mixing bowl, combine the graham cracker crumbs, sugar, cinnamon and melted butter. Toss with a fork until all the crumbs are moistened and the ingredients are evenly mixed. Transfer the mixture to the prepared springform pan and press the crumbs in an even layer over the pan bottom and about half to two-thirds of the way up the sides of the pan. Bake for 6-8 minutes, until golden in color. Let cool for about 10 minutes. Pour a layer of caramel into the bottom of the crust and sprinkle evenly with the chopped nuts. Refrigerate the crust while you prepare the filling. 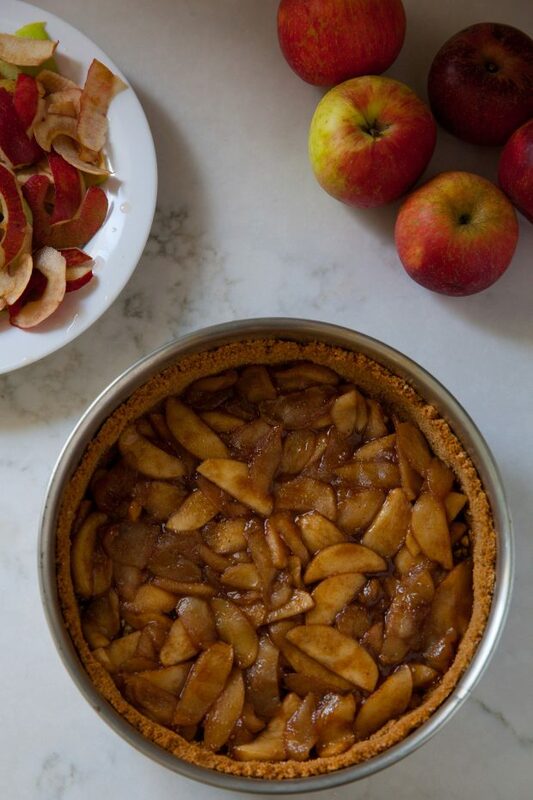 To make the apple filling, melt the butter in a large skillet over medium heat. Mix in the brown sugar, salt and cinnamon and cook for 1 minute, until bubbling. Mix in the apple slices and toss well to coat. Cook over medium to medium-high heat until tender and most of the liquid has been reduced, about 15-20 minutes. Let cool for a few minutes and pour into the prepared pie shell. Set aside. Reduce the heat of the oven to 350° F. To make the cheesecake layer, combine the cream cheese and sugar in the bowl of an electric mixer and beat on medium speed until smooth, about 1 minute. Mix in the vanilla, egg and lemon juice until fully incorporated and smooth, 1-2 minutes. Spread the cheesecake filling into an even layer over the top of the cooked apples in the crust. Bake until a knife inserted in the center comes out clean, about 30 minutes. Remove from the oven, transfer to a wire rack and let cool to room temperature. Refrigerate for at least 4 hours. To serve, carefully remove the sides of the springform pan. In the bowl of an electric mixer fitted with the whisk attachment, beat the heavy cream and confectioners’ sugar on medium-high speed until stiff peaks form (being careful not to overbeat.) Spread gently over the top of the chilled cheesecake layer. Top with dollops of caramel sauce and swirl with a knife to create a marbled effect. Sprinkle with a handful of chopped nuts if desired. Slice with a long, thin knife to serve.